Decoration : Inspirational ideas with an old electric wire spool or an wooden cable spool. Inspirational ideas with an old electric wire spool or an wooden cable spool. This kind of large electric wire spool or wooden cable spool is not so easy to find but if you have the chance to get hold of one of them, do not miss it! You will see in this article, 19 wonderful ideas that people have realized with different sizes of spool. I especially like the model with the rope on the reel! A little reminder of what it used to do! Perfect for storing children's books! A nice piece for the hallway! A perfect table in the corner of the living room! 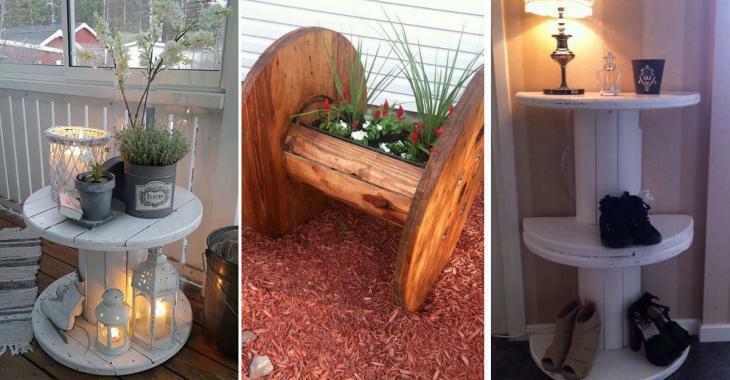 Perfect for the garden area! A patio side table where you can keep drinks cool! A great piece for the yard! My favorite! A sea-themed table with rope in the center of the reel! White and natural color for a Shabby Chic look! All in white for a Shabby Chic look! A splendid bench dyed various colors! A lounge table lit from the inside! A bar lit in blue!